For a year now Johnsons Marketing has been kept in the dark, supplying marketing behind the scenes and building a team of superb marketers… As of May 3rd 2017 (our 1st business birthday) we have finally come out of the shadows to offer our marketing services to the businesses of the world. Ok well… that sounds a tad dramatic but yes, we have launched a brand new website and moved to a new and improved, modern office. JM are officially publicly open for business and our new attitude to marketing is ready to help you improve your marketing in today’s hectic world, in which everyone is competing to be the best. 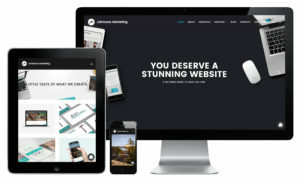 After many adjustments to create a website that is easily navigable and yet shows our design capabilities; We have finally launched our company website site, exactly a year after Johnsons Marketing founded. Information about our services & the team. Live Chat where you can ask us anything…go on try it! However, we don’t believe that a website should be left to rot, so we will be posting blogs every two weeks, helping you understand how we make, market and measure for our clients. Along with this blog, we will also keep you posted on the latest office pranks, news in the world of business, case studies, and any news that may affect your industry giving you the head start to prep for these changes. We’re also happy to announce that we’ve moved to a bigger and better office. Don’t worry, we’re still located in the center of Burton-Upon-Trent. In fact, our new studio is located in the brewing sector of Burton, Cross Street in the Cross Street Business Centre. 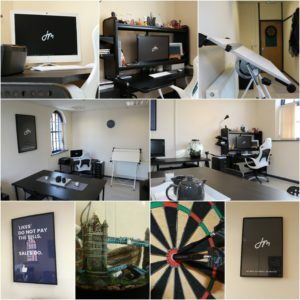 The new studio is now ‘client ready’ featuring a board table, tea pot & milk jug – with some added perks for ourselves (since being constantly creative can require inspiration) via a dart board and tropical fish tank with our watery friends: Tom, Hardy, John, Snow and 5-year-old Bruce! These guys put some life in the office when we have our heads buried in creating the best work we can. The new office is open between 9-5 so make sure to pop in. Questions you should ask yourself as a business owner?